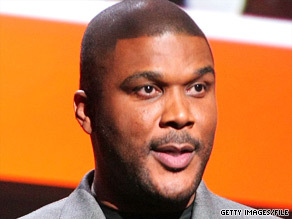 NEW YORK (CNN) -- Tyler Perry, the star, writer and producer of films such as "Madea Goes to Jail" and the television show "House of Payne," could be adding philanthropist to his growing list of credits. Tyler Perry is sponsoring a trip to Disney World for kids at a largely minority day-care center. According to his publicist, Perry is sponsoring a Disney World trip for 65 Pennsylvania children at a largely minority day-care center after a swim club canceled pool privileges for the children. "He wanted to do something nice for them and let them know that for every negative experience, there are people out there who want them to succeed regardless of the color of their skin," said Keleigh Thomas, Perry's publicist. She added the entertainer would be footing the bill for all transportation, hotel, admissions and food costs at the Florida theme park. When Perry heard about the situation with the children in the highly publicized aftermath of the pool cancellation, he immediately wanted to help them, Thomas told CNN, adding that a trip to Disney World is definitely "better than the pool." "I am ecstatic for the children," Alethea Wright, director of the Creative Steps day-care center, told CNN. Perry's team extended the offer to her on Friday, she said. The Disney World stay will be from August 1 to 3, according to Perry's Web site. The pool controversy started after the Valley Swim Club in suburban Philadelphia revoked the swimming privileges for children from the Creative Steps center after one visit on June 29. Some black and Hispanic children said white club members made racist comments to them during that visit, asking why "black children were there" and raising concerns that "they might steal from us." Soledad O'Brien investigates what African-Americans are doing to confront the most challenging issues facing their communities. You'll meet people who are using groundbreaking solutions in innovative ways to transform the black experience. The day-care center had originally contracted to use the pool during the summer, but the club canceled the agreement and returned the day-care center's $1,950 check without explanation. The club canceled contracts with two other day-care centers because of safety and crowding, swim club director John Duesler said. Those facilities have not protested the club's actions. The issue was exacerbated when Duesler told two Philadelphia television stations the children had changed "the complexion" and "atmosphere" of the club. The comment brought protesters outside the facility. Duesler later said that safety and crowding prompted the cancellation. As the controversy grew and reached national news shows, the swim club asked the Creative Steps day care to return. It refused and said it would pursue a lawsuit. In a statement posted Monday on his Web site, Perry summed up his feelings about the pool situation: "This made me so angry," he wrote. "This is awful, and for anyone that has grown up in the inner-city, you know that one small act of kindness can change your life," he wrote, adding that with the trip to Disney World, "I want them to know that for every act of evil that a few people will throw at you, there are millions more who will do something kind for them. This is all about the kids."